A Girl Like Me, a book I have been waiting for since I read A Boy Like Me. This story is as powerful and as beautiful as the first. When the last book ended, Wes was lost and everyone thought he was dead. I knew just like Josselyn that he was alive, hiding but never really far. Joss was strong without West, she had always been a tough chick. But when Wes disappeared, she was broken and wouldn’t give up her search for Wes, until she found him. I love the connection that Wes and Joss had, no matter how far apart they were they felt each other. They knew they belonged to each other. 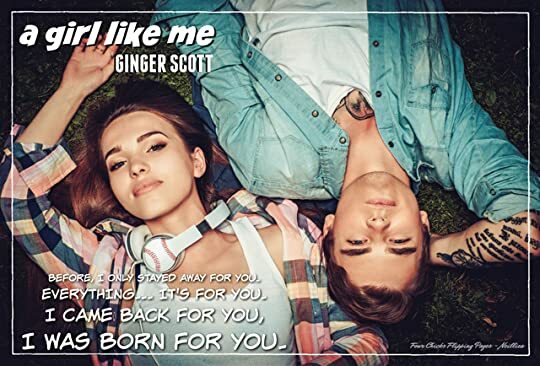 Author Ginger Scott left us all with such a big cliffhanger, but I knew that she wouldn’t disappoint. The wait for this book was worth it, what she gave us was so much more than I expected. I love the idea of a Superhero living in the real world, saving and making sure everyone he loved was taken care of. He didn’t go out there looking for trouble or problems in the world, Wes watched out for his love ones and he did it with everything he got. Wes may not fly, but what he did with what he got was amazing. He was a man who loved with all that he is and that was his biggest power. Without love Wes would be a lost boy, just like he was before he met Jocelyn. West and Josselyn’s may have gone through so much together, but their story ended so beautifully. Their love for each other conquered all and their story may have ended in the book world, but their ending was just the beginning of the beautiful life I see them having. A real life superhero book, I truly enjoyed.